The purpose of Landfill Construction Quality Assurance is to ensure that the landfill is constructed in full compliance with the specification. The primary responsibility for ensuring this, rests with the landfill construction (civil engineering) contractor. The landfill CQA Engineer who is resident on the site, provides independent inspection and verification of the work, and receives all the contractor’s site construction quality assurance records. The appointed Landfill CQA Engineer is normally required to inspect all parts of the works constructed during the landfill development contract works which will control the potential emissions from the site. So, the CQA Engineer is normally required to inspect, witness test, and verify the recording of all the subsystems except possibly for the road/access network. Even within the road network he/she would also normally inspect the work such that the road networks installed for access close to the development works will not be such as to risk damage to the integrity of the liner, waste cell walls, or capping. The appointment of a Landfill CQA Engineer is usual at all landfill development projects where landfill CQA principles must be applied, so a Landfill CQA Engineer is appointed for all landfill developments where the wastes accepted potentially pose a risk of water pollution, including all those accepting household, commercial and industrial wastes. All landfill CQA engineers must have a good knowledge of the construction of basal liners and landfill gas collection systems. Landfill CQA engineers verify that the CQA programme specific to the site and the detailed design adopted, is carried out by the construction contractor. However, the importance of liner integrity (or liner failure) at each site will vary according to the results of the site Hydrogeological Risk Assessment (HRA). So, the landfill CQA engineer will normally provide a sample checking role based on the most detailed checking in accordance with the sensitivity results of the HRA, this will need to be consistent with the liner design itself which will have been chosen to comply with the degree of engineered containment required by the HRA. 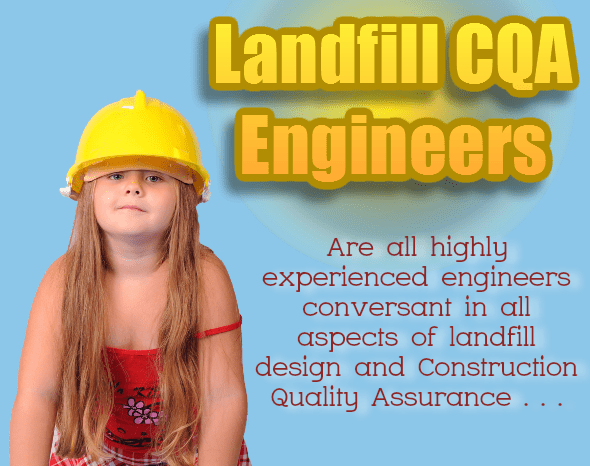 The landfill CQA engineer will normally have extensive experience in providing project management and QA/QC services for landfill construction projects. He will verify that engineering, technical, surveying and laboratory sub-contractors to be utilized for any particular project will be familiar with the surveying, field inspection, field testing, and laboratory testing requirements, in addition where appropriate to the mechanical/electrical oversight necessary to complete the project. Engineers and technicians will nromally be trained in the use of each piece of equipment, and be certified to operate these items, such as nuclear density gauges, global positioning systems (GPS) or electronic distance measuring (EDM) equipment, and data recorders. The landfill CQA engineer will be able to call upon specilists to advise him on the contractor’s compliance with the contractual requirements for documenting and certifying ancillary installations required on the project (e.g., any holding tanks, pumps, control panels, etc.). The landfill liner is normally the most important part of the landfill containment system. The landfill CQA engineer in Europe (where the Landfill Directive rules apply) will always be required to oversee full containment lining designs. outside the EU the range of allowable design solutions is much wider, so the landfill CQA engineer must also be familiar with the methods developed to accommodate a range of seapage rates from really low (the best containment that can be achieved) to higher (a controlled sort of dilute and attenuate lining solution) depending on the level of environmental protection required at that site. Quite a few landfill specifications use absolute phrases such as “complete containment”, “prevention of leachate and landfill gas migration”, and “impermeable”. These terms can lead to the erroneous belief that this is quite literally achievable, and that failure to do so is indicative of bad products or workmanship. In fact, on such large structures, even using the best technologies to the highest installation quality, it is not possible to prevent every drip from escaping. So, the landfill CQA engineer needs to be familair with how such risk assessments for environmental damage are normally carried out in such a way that these limitations are specified and catered for. Landfill, and landfilling is at the core of waste management (which includes MSW landfills and Hazardous Waste Landfills) and is a major, multi-billion pound industry which is certain to grow more than ever before, over the coming years. Because of the potential for improperly constructed landfills to leak highly toxic materials into surrounding soils, surface waters, and groundwater, they are necessarily tightly regulated civil construction projects and the prospects for the landfill CQA engineer to find work are improving as the demand for their services rises with the increasing number of landfills worldwide Proper and thorough inspection, testing, and documentation is always imperative for landfill sites to ensure soil and groundwater protection. There are many self employed landfill CQA Engineers who offer their services for the construction and restoration of landfill sites. They are also frequently adept at liaising with the client, contractor and environment agency. Ensuring that construction works are undertaken in accordance with the method statement/design specification for site works, is routine for them, as is the testing, sample collection and keeping of daily records and files. If you are seeking a UK based self-employed landfill CQA Engineer for your landfill project CQA role, we offer to assist you by either directly resourcing a suitably qualifies engineer ourselves, or introducing you to other landfill CQA engineers who offer this service. It is simple to get in touch with us. Just click here to go to our Contact Form and add the details. When we receive your enquiry we will contact you, and we normally reply within 3 working days.